This was a polish that was a lemming of mine for an exceptionally long time. I don't own a lot of indie brands, but this was the first I ever saw use the big circle glitter and I fell in love. 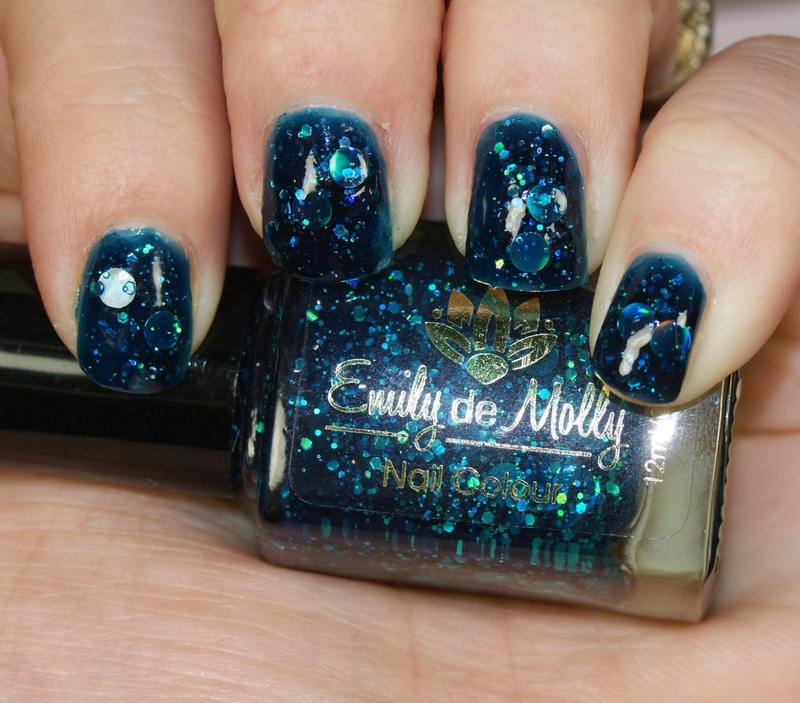 Check out Emily de Molly Oceanic Forces! Oceanic Forces is a dark teal jelly base with silver holo and hex glitter. The above is with three coats. The goods: This color is stunning. The depth of the jelly is breathtaking and there are plenty of silver circles to go around. The bads: The circular glitter took a long time to fish out, the polish took even longer to dry, and last, it turned my nails yellow. YELLOW. And I use basecoat! Now, it could be that the polish reacted poorly to the basecoat, which was the OPI Glitter Base. I didn't care to try again with another, but would be interested to hear if you've had similar or different results with other basecoats! Emily de Molly is available via the brand website for Australian residents or at seven different stockists, which cover the US, Canada, and Europe, and ship worldwide! Prices vary based on retailer. This is gorgeous, but I hear you on the fishing and the staining. I don't have this so I can't suggest another base coat, but I'd be interested to hear what others think. It's a tricky polish to say the least, but it is so pretty! It didn't stain me when I wore it! And it definitely helps to store the bottle upside down. Or even turn it upside down for a few minutes before application. When I do that I get tons of circle glitters!